Minerva stared in horror at the box of rocks and tried to calculate exactly where her desk was in relation to where the box had been sitting. Had she really been sitting under a pile of uranium for the entire time she’d been working at the museum? “Who are you?” Minerva frowned. “Unexpected authorial interference.” The Author repeatedly backspaced until Minerva was erased entirely. It was cold in the attic. Minerva stepped around the plastic-draped and possibly animatronic Santa and looked up on the top shelf. There was, in fact, a moose up there. 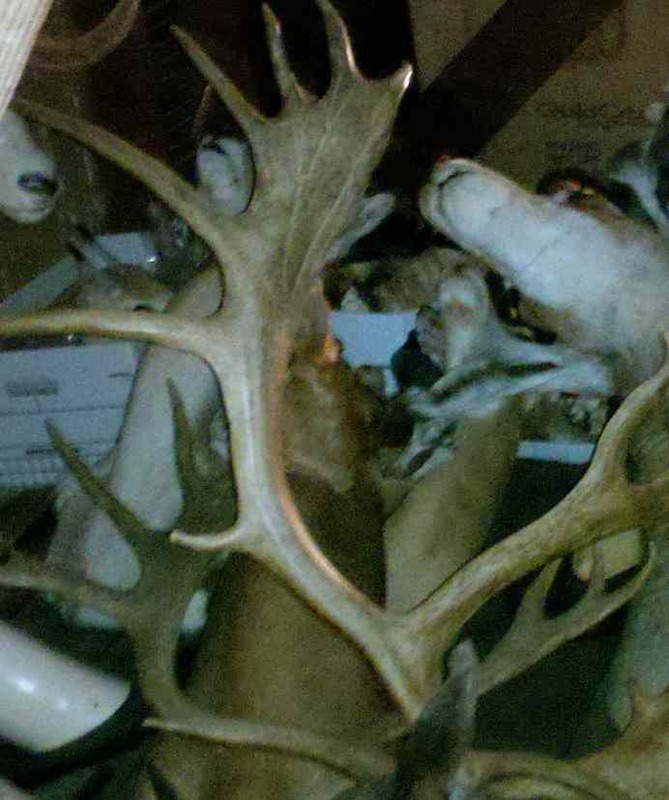 Only in museum work could you lose one taxidermied moose, and when you went looking for it– find three, none the one you were looking for. She reached up and turned over the artifact tag on the moose antlers. Make that four meese, and one still missing. Damn things were breeding somehow. Minerva backed up against the opposite shelving unit and peered up at the top shelf. It looked like there might be another pair of antlers up there, maybe two? She looked around for the step stool, but remembered it was downstairs. She set down her clipboard on an antique saltines tin, and placed her left foot on the opposite shelf. She pushed off and got a foot on the second shelf of the moose shelving unit, her fingers hooked over the top shelf, the plastic dust sheeting over the moose antlers brushed the back of her hands. Minerva pulled herself up and stepped up to the next shelf. There were four more sets of elk antlers and one very small set of moose. She reached across the shelving unit and started dragging the second set of antlers closer. As the antlers got close enough for her to almost read the tag, the shelving unit started to tip toward her. Antlers tumbled toward her and things on the lower shelves started to slide. Minerva tried to shift her weight toward the shelving unit to stabilize it, but it’d tipped too far. She felt a disorienting rush of blood in her head as she and the unit fell into the other shelving unit with a crash. There was pain, then the second unit started to fall in a chain reaction. The bottom of the cardboard box fell out and landed at Minerva’s feet with a putrid wet slap. “Oh god,” she groaned, and then regretted the inhale of breath required for speaking. The plastic bags wrapping whatever had been in the box originally had been gnawed up into bedding. There were rat droppings throughout the contents. The whole thing would probably glow under blacklight like a horrible rave grab bag. In the middle of ruined artifacts and shredded wrapping, was a very large and mostly decomposed rat. Minerva dropped the empty top half of the box and opened the large roll-door. The fresh air from outside was still tinged with the scent of excrement and rot. She looked down and realized the sleeves of her jacket were damp with filth. This was how a quick trip out to move things in the shed building turned into a trip home for a full change of clothes and a scalding hot shower. Minerva used a shovel to pick up the pile of wet trash. The rat corpse fell into two pieces releasing a new, stronger smell. She dumped everything on the trash pile outside, and went back in. The sooner she got this done, the faster she could get that shower. Minerva used a broom to smack the side of the next box on the stack. It was dirty and stained too, but mostly on the top, though there was some indication of gnawing by the handle holes. Nothing moved in the box. Minerva hit it again. She heard scurrying over on the other side of the building and jumped back. She went to run hands over her hair, and stopped before she made the contamination worse. She picked up the box and jogged a few steps, swinging the box back to fling it toward the trash pile. Something shifted inside the box. A soft weight slammed into her hand. She let go, but not before something sharp bit into her hand. The box fell to the concrete floor and a rat went drunkenly scurrying under a pallet. Minerva ran outside, heart pounding in her chest, and breathing in terrified gasps. Blood welled up in a series wounds across her fingers. Minerva walked over to the end of the pier and peered down at the water slapping against the barnacled pilings twenty feet below. She pulled out her phone and checked the time. The donor was late. Despite efforts by herself and a coworker to convince their boss this was a horrible idea, here she was waiting for an “anonymous donor” who was bringing artifacts of questionable origins. Her boss had decided that getting the items out of private hands was worth the headache and ethically gray area. Minerva was pretty sure there were rules or laws or something that said otherwise, but liked her job, and knew that in the long run, her boss was probably right. The weather app on her phone said 63 degrees but here on the water with the wind, it felt much cooler. Footsteps reverberated through the pier. Minerva tucked her phone in a pocket and fingered the envelope her boss had given her. While she technically didn’t know what was inside, it wasn’t hard to guess. The man walking toward her was carrying a wooden box. The probably illegally obtained artifacts were supposedly from a local archaeological site. Minerva extended the smile most people misinterpreted as friendly, and took a step toward him. The sooner they got this over with the better for everyone. “I talked with a man on the phone.” The man shifted the box to one side. “How much?” asked the man, confirming her suspicions. Her smile faltered. “Look, I don’t want to know. I can’t know. Don’t tell me.” She stepped forward with the envelope outstretched. The man took the envelope and stepped back, as he ripped it open and counted the contents. Minerva looked away, across the water toward the rhythmic noise from where they were doing experimental drilling, looking for bedrock under the sediment on the bottom of the bay. She strongly doubted they’d find any. The drilling must be scaring the fish. There weren’t any fishermen on the pier. “Huh?” Minerva turned back to find a gun pointed at her from under the wooden box. Most of it was obscured, but it looked like a .22 automatic. For a moment she considered arguing, then pulled out her phone. “No.” Minerva looked back toward shore, which suddenly looked a lot further away. Minerva raised her hands up next to her head. “Just take it. I’m not going to stop you.” Her uncle was totally going to kill her for not having her concealed carry permit if she got out of this. “You got any cash?” The man was visibly perspiring, his eyes twitching all around. “Just cards.” Minerva reached for her wallet. “Get on the rail!” He switched the gun to his other hand. Minerva stepped backward until the railing pressed into her back. It took her three tries to push herself up backward so she was sitting on the wide wooden rail. Her brain randomly speculated that the rail was probably totally coated in bird crap as she held on to it with both hands. Movement on shore drew her eye, and her head followed her gaze. A police car was slowly cruising through the parking lot. A loud pop echoed over the water, and a sharp impact slammed into Minerva’s gut. “Shiiit,” she said doubling over, one hand going to the wound. A second shot hit her in the leg. Aw hell, if she was going to get shot, why did it have to be with a smaller caliber? This wasn’t even going to kill her. She hooked her uninjured leg around the railing and slapped him in the face with her blood covered hand. He pushed the box harder into her midsection trying to unbalance her. She grabbed his collar. He hit her in the head with the box. As Minerva fell backward off the pier, she suspected there weren’t even any artifacts in that box. Minerva jumped back in her seat and stared in horror at the YouTube video. She’d expected a bit of a bang and a puff of smoke, not the vigorous explosion she’d just seen. She looked over the article again. “Used as a burn treatment” — who the hell used something that could become explosive as a burn treatment? “Found in Boy Scout first aid kit…” Well, at least they didn’t have any Scout first aid kits at the museum. Picric acid in liquid form was fine. Picric acid that had evaporated even partially was highly explosive, friction and shock sensitive. 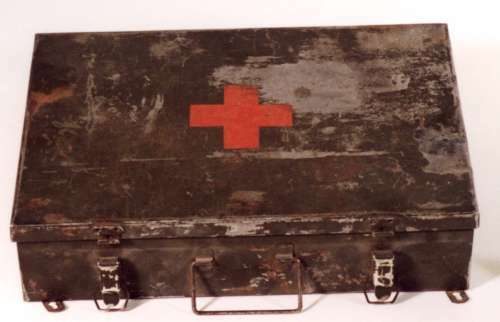 It was used in some, but not all WWII military first aid kits. Minerva took a deep breath and slid the last first aid kit off the shelf. Four other kits had been checked and cleared. None had contained picric acid burn compresses. One had even been empty. Minerva’s gloved hands stuck to the metal as she tried to readjust her grip without tilting the box. Minerva lowered the metal box to a table, keeping it level and setting it down very gingerly. Her hands peeled away covered in a sticky black liquid. She un-did the metal latches, wincing as the box jostled with each movement. She tried the lid. It didn’t budge. Tilly had backed up a step with each movement Minerva made with the box. Tilly didn’t need to be told twice. She was down the stairs and out of the blast radius within seconds. Minerva pulled out her keys and tried to carefully leverage the sticky box open. The rubber seal schlurped as it was parted from the metal lid. Minerva really hated rubber gaskets. She raised the lid enough to get her fingers under and wrench it open. The small paper boxes inside were soaked with various liquids, one of which was odorously iodine. The vials of smelling salts had also broken soaking into several adjacent boxes of gauze pads. She scanned for the “Burn Treatment” box and squinted at the chemical description underneath, obscured by yellow crystals. Minerva used one gloved finger to wipe away crystals away from the letters, dragging unstable crystals of picric acid along the paper, like striking a match. It was a closed casket funeral. Minerva turned the crank that moved compact shelving along tracks in the floor. Now was military stuff on row five or row six? She could never remember. She walked part way down row six, moved the shelves over one more space and started to scan the carefully labeled banker boxes that lined the shelves of row five. She started at the top looking for the word “patches”. Someone off the internet was looking for a picture of an 86th Air Division patch and the catalog said they had one… somewhere. That was the problem with having records that were only partially digitized and no complete inventory of collections since the early 80s. Card catalogs and ledger books provided often incomplete or outdated information about the location of objects. This was how Minerva had once managed to misplace a moose and then when she went looking for it, found four. Damn taxidermy was breeding when she wasn’t looking. She was sure of it. Her eyes scanned over the boxes, Naval Hats, WAVE Uniforms, Books Military, Ordnance. Wait, what? She looked again at the box on the second to bottom shelf. “Ordnance, Rockets, Bombs, Projectiles – US” which was sitting next to “Bombs, Projectiles – Japanese” and a third box labeled simply “Ammunition”. There was absolutely no way these boxes were labeled correctly, was there? Minerva tried to lift the lid to peek inside without moving the box, but there wasn’t enough light. Verrrry carefully, she slid the box out, holding it level and slowly lowered it straight down to the floor. She didn’t breathe as she lifted the lid off the banker box. Her breath escaped in a long pursed breath as the light showed a jumble of canisters, metal cones, and rocket-shaped objects. She pulled the inventory list out of the box and looked for indications in writing that everything had been disarmed. Some of the items hadn’t even been properly identified. Every single item had, however, been carefully labeled with a museum accession number. “Who the hell would label a bomb, write ‘bomb’ in the catalog, stick it in a box and label the box ‘bombs’? !” Minerva rubbed her hands over her face and consciously forced herself to breathe. Minerva really hated her predecessors. Really, really hated them. One of the rocket-shaped items in the box seemed to be previously fired. At least it was charred around a hole in the bottom and looked empty inside. Maybe they’d all been drilled out? She picked up one of the metal cone-shaped projectile and looked for indication it had been disarmed. It felt heavy in her hand and when she looked at the back-end, there was no indication that it had been modified in any way. Her hands were sweating. The metal felt slick beneath her fingers. Crap, she really should have grabbed some nitrile gloves. She tried to readjust her grip. The grenade slipped from her fingers and dropped. She reflexively tried to grab it, flipping it end over end in the air. It struck back-end down on the metal tracks in the floor. Smoke and flame rippled through the row completely engulfing Minerva before she had time to react. The grenade detonated in the far wall of the building, taking most of the olive-green baby grand with it. Minerva cleared a space on the counter and set down the metal tray containing scissors, tweezers, and a bbq lighter. The museum was applying to a grant for improving their photographic collection storage. 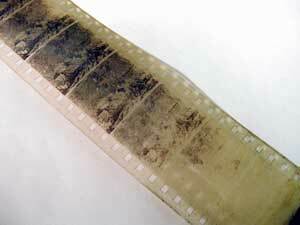 One of the questions asked if they’d ever tested their collection for the presence for nitrate film. She was about 99.999% sure there was some in the collection, but hadn’t actually tested for it– until now. Luckily the grant didn’t require knowing what percentage of the collection was nitrate film, just if they had any at all. She looked at shelf after shelf of archival boxes stuffed full of paper envelopes. The envelopes were full of prints and negatives arranged by subject. Minerva frowned, shrugged, and grabbed the box marked “Automobiles”. Might as well start at the beginning. Minerva opened the box and fished out the two envelopes that indicated they held negatives. The first was full of contemporary, drug-store developed negatives from a car show in the 1990s. She set it aside. The second envelope was jam-packed full of oversized negatives and had a slightly chemical vinegar smell. She leafed through them until she found a 5×7″ negative of a man standing next to an early automobile, maybe a Holman. The negative had an unusually wide margin to the left of the image. Minerva carefully trimmed off 1/4 of this edge to square up the border in line with the other 3 sides. No one would even notice its removal. Minerva picked up the trimmed edge with the tweezers and held it at arms length over the metal tray. She picked up the bbq lighter and clicked it on. The slightly blueish flame of the bbq lighter didn’t quite touch the negative before the whole thing flared up in a gigantic flare of yellow flame. “Jesus!” Minerva jerked back and the flaming bit of cellulose nitrate slipped from the tweezers and landed on the pile of negatives on the counter. They quickly caught fire and the flames shot several feet up and caught the shelves of archival boxes on fire.